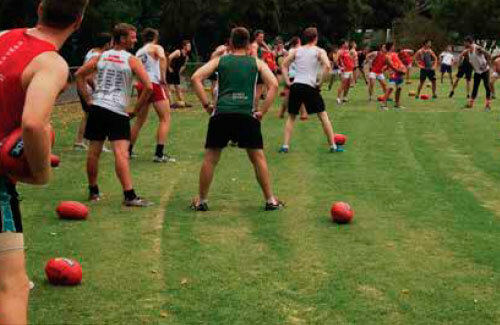 WITH the 2014 EFL season approaching rapidly, the Warrandyte Bloods are getting back down to business, kick starting their official pre-season training schedule on the January 29. For new senior head coach Michael Tout, it was a day that couldn’t come soon enough, as the new man has been ready and raring to go since being appointed. “The Christmas period and holiday season is really slow when actually playing any footy is concerned, so it just feels great to get back out on the ground with all the guys and start working again,” Tout explains. The energy and anticipation was not misplaced, as coaches were ecstatic with the turnout and professionalism of the opening session, with at least 50 players lacing up the boots for tough summer training, as well as completing an 8km run in Run Warrandyte last weekend. “I’ve been so impressed with the numbers we have, with players getting on board, the president’s doing a great job and the players are as well,” Tout says. Additionally, more good news arrives in the signing of another high quality player in Lewis Oliver, a powerful young centre half-back from the Picola League who is sure to add some punch to the backline in the senior side. Development and progress has not been limited to the senior side, with the Reserves and Under 19s also benefiting from the tidal wave of excitement and positive change encircling Warrandyte football for the coming season. “We are all about bringing a smile back on everyone’s faces, we are going to train hard and put in the work from right now on day one, and if we can do this properly we are expecting some good results,” Watto says. Now training twice a week until the season kick-off, Watto believes a quick turnaround is not out of the question for the recently relegated Bloods. With the concept of a swift regeneration very much in mind, coaches and members of the board and committee are keenly awaiting the first of the club’s pre-season games at Templestowe on March 16, followed by a game against Latrobe University the next weekend. WITH the Christmas holidays a distant memory and school now well and truly back in full swing, preparations for the 2014 football season, which begins on April 6, have commenced in earnest for the Warrandyte Junior Football Club. The club will officially kick off its pre-season on Sunday, February 23 with a team building day at Clifford Park Activity Centre. With an emphasis on seeing each and every player reach their full potential within a strong, friendly and supportive club, the WJFC embraces respect for each other as well as for its opposition and umpires. The junior Bloods are once again expected to be super competitive on the field, with teams in the Tackers, Under 10s, Under11s, Under 12s, Under 13s, Under 14s, Under 15s and Colts. The club is particularly interested in boys seeking to play football at Under 13s level where, due to strength of numbers last season, there is every chance a second team could be formed for the coming season. In addition, the club is pleased to be associated with the Doncaster Heights Dockers Junior Football Club in forming a merged Under 17s team for season 2014 in the highly competitive Colts age group. A highlight of this association is the link the DHJFC has with last season’s AFL grand finalists, the Fremantle Dockers, which will see the merged team travel to Fremantle over the Easter period to see up close and personal what happens at an elite AFL footballclub. The boys will have the opportunity to use the Dockers’ facilities, meet the players and play in the curtain raiser to the Round 4 Dockers v Essendon clash on April 13. The trip is particularly significant given the recent signing in the AFL Rookie Draft of former star Warrandyte junior Jacob Ballard to Freo. Registrations are well and truly open for all age groups, with players being able to register online via the club website www.warrandytejfc. org. More details on the club’s Team Building Day at Clifford Park will also be available on the club website.